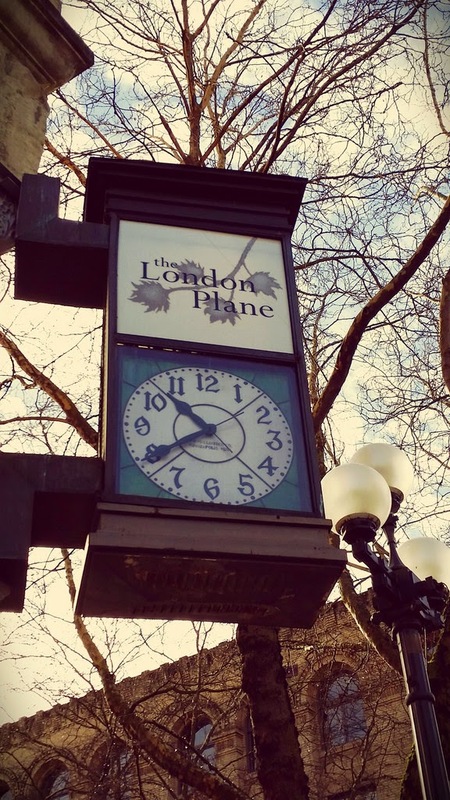 Last weekend I had Brunch at The London Plane in Pioneer Square. 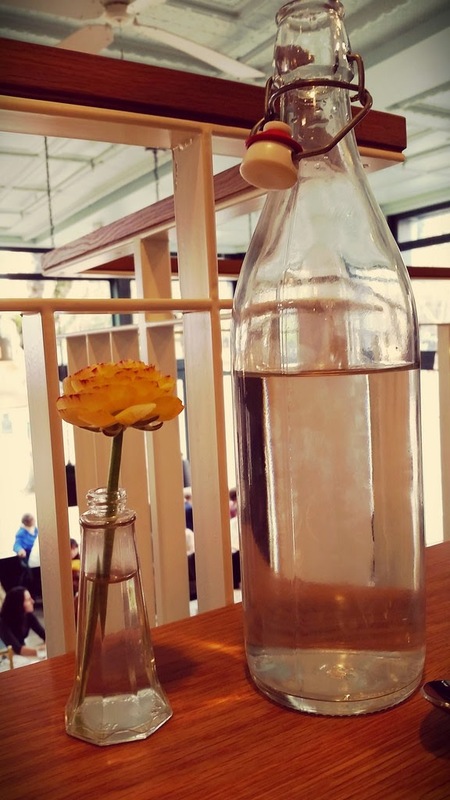 I have been wanting to eat at this cafe since it opened a year ago. The London Plane is owned by Mathew Dillon who also owns the popular Sitka and Spruce, The Corson Building, bar ferd'nand, and bar Sajor. It is also a partnership between Katherine Anderson, owner of Marigold and Mint. 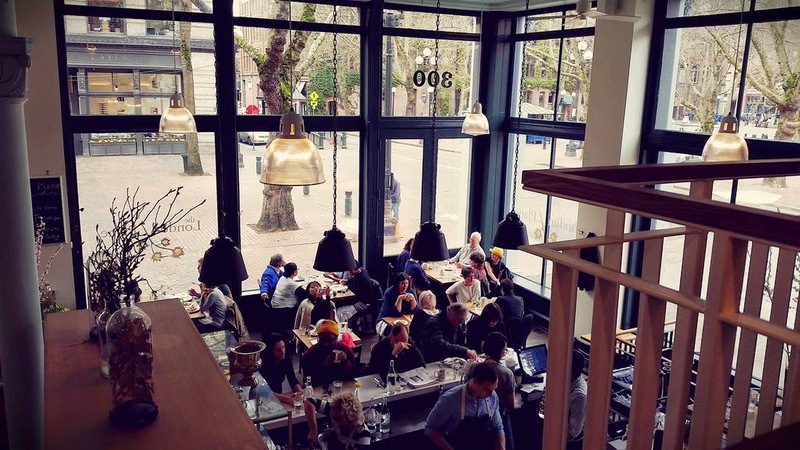 The London Plane is one of many new restaurants that have opened in Pioneer Square over the last year that has started a revitalization of Seattle's oldest neighborhood. The London Plane is located at 300 Occidental Avenue South. It is a corner space in a beautiful historic building. The space has huge floor to high-ceiling windows that just flood the space with natural light. When you enter the cafe you are greeted by a large table of beautiful flower arrangements from Marigold and Mint. The counter to the right offers fresh bakery goods and an array of salads, soups, and other delicious looking food items. There is seating available upstairs on the second level that offers up a great view of the main dining area and cafe bar. I was really looking forward to trying the food at The London Plane. Matthew Dillon had huge success with Sitka and Spruce, so I had high expectations. I decided to start with one of the baked goods, as they all sounded so delicious. I wanted to go with the orange scented morning bun, but they were unfortunately out of them that morning. 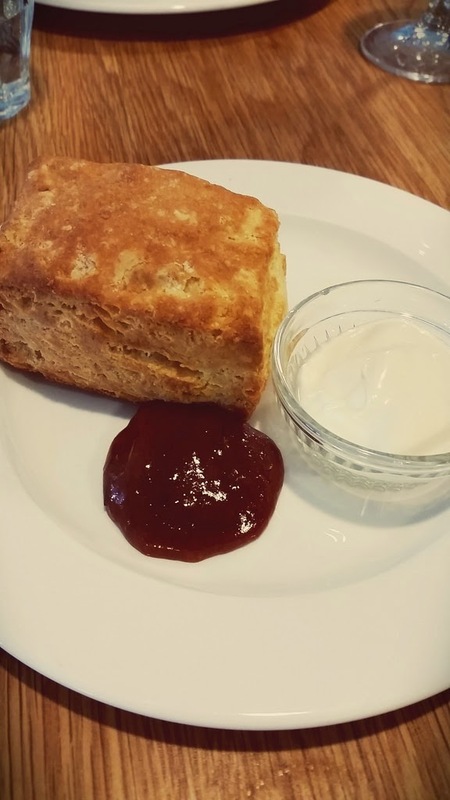 I went with my second choice, the warm biscuit with seasonal preserve and crème fraiche. I'm not going to lie, this biscuit with the preserve and crème fraiche was one of the best biscuits I have had in a very long time. So I'm kind of glad they were out of the morning bun. I love Brunch. It gives me an excuse to have an alcoholic beverage in the morning. Not that I really need an excuse. 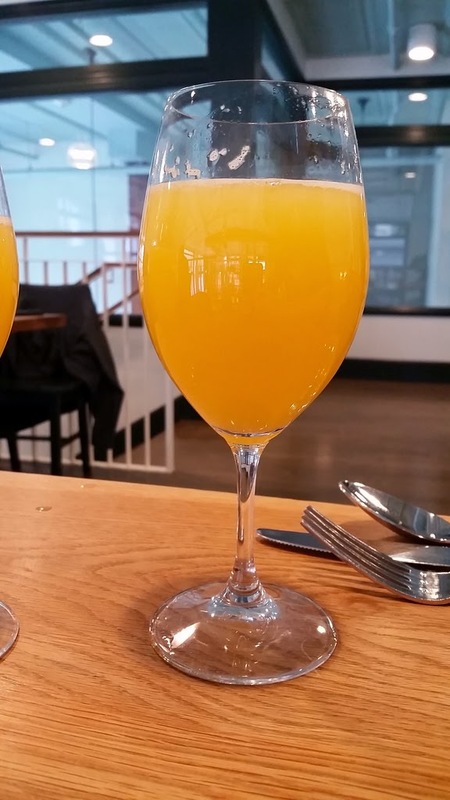 The Mimosa was very tasty and it was a generous pour. So we were off to a good start. Next came the main dish. 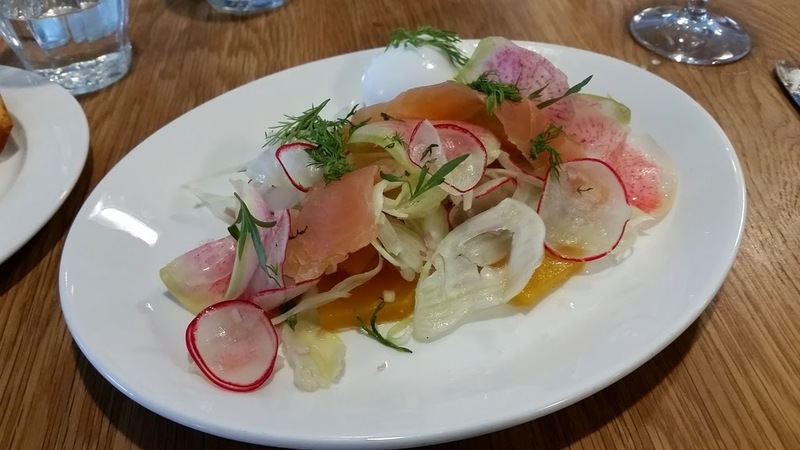 I ordered the salt cured king salmon with marinated beets, fennel, crème fraich and a boiled egg. First off, the presentation of the food was amazing. The food almost looked like a floral arrangement, and it tasted as good as it looked. Everything was so fresh and full of flavor. I really liked the paper-thin shaved radishes. I'm a big fan of fennel, and this dish had just the right amount to not overpower the salmon, which was delicious! The boiled egg was just slightly more than soft boiled and the yolk just slowly oozed when I cut into it. I would definitely come back for more of this dish. 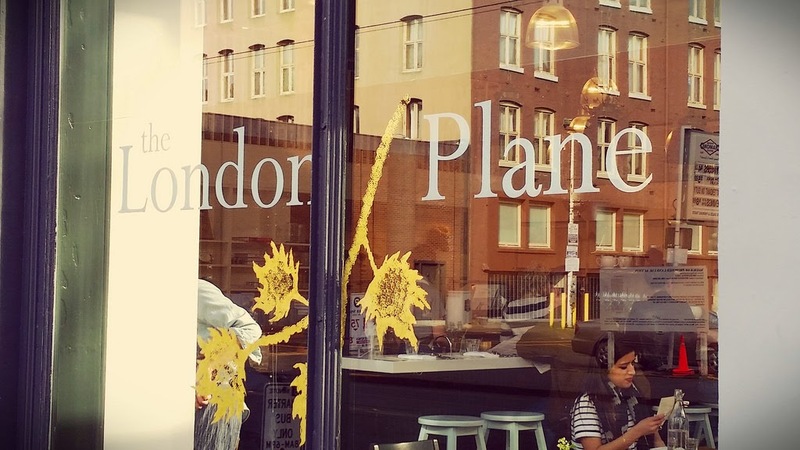 The London Plane is also a specialty foods store. They offer foods, gift ideas, cookbooks, soaps, cards, tableware, and other great food-related items. I highly recommend stopping into The London Plane,either for some delicious food, or to wander through their store items. If you do plan on going for dinner, I would suggest making reservations, as they tend to fill up very quickly.